Beerakaya aka ridge gourd is a favorite vegetable of mine. Most often I make a milk based ridge gourd dish, Beerakaya Paalu Posina Kura, which makes for a delectable side with both rice and rotis or beerakaya kootu or ridge gourd pachadi. 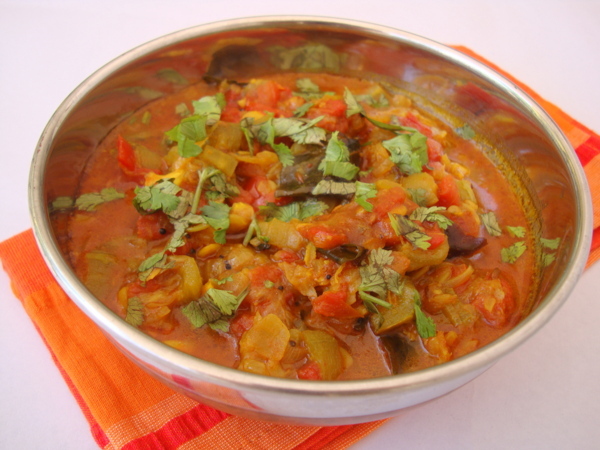 Today, its a Beerakaya Tomato Kura, an everyday Andhra style vegetarian curry, simple to make and tasty. Do not omit the jaggery and saunf (aniseed) because they both give this curry a savory yet sweet flavor. Ridge gourd tomato curry goes best with rotis but tastes equally good with rice. Heat oil in a cooking vessel, add the mustard seeds and allow to splutter. Add crushed garlic and curry leaves and saute for a few seconds. Add the chopped onions and green chilies and saute for 4 mts. Add turmeric powder and chopped ridge gourd and cook on low to medium flame for 4 mts. Place lid and cook for 10 mts. Add red chili powder, coriander powder. saunf powder and roasted methi powder and cook for 2 mts. Add the chopped tomatoes and cook with out lid for 5 mts. Place lid and cook for 5 mts. Add a small cup of water, salt, jaggery and garam masala powder and place lid. Cook on medium flame till it reaches curry consistency. Once done, remove onto a serving bowl and garnish with chopped coriander leaves. Towards the end of the cooking process, you can add a pinch of garam masala as a variation to the above curry recipe. If you do not have roasted methi powder, you omit it OR add 1/4 tsp of kasuri methi (dried fenugreek leaves) when sauteing the onions. By Sailu Published: June 19, 2012 Beerakaya Tomato Kura, an Andhra style vegetarian curry that is simple and quick to make. 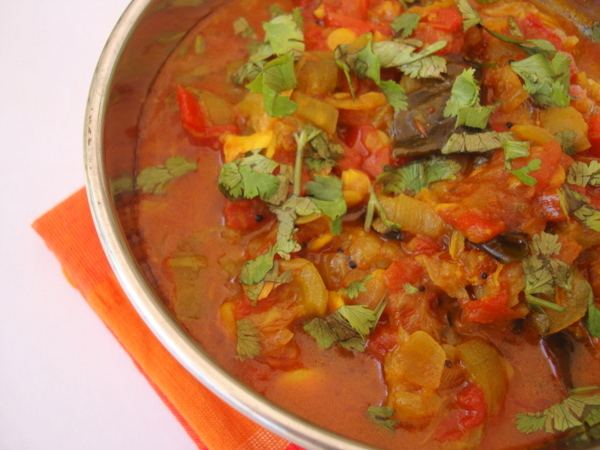 Ridge gourd tomato curry goes well with rice and rotis. This is what we are planning to make for dinner today to go with chapathis.. Will try your version sometime.. thanks for sharing! The color is stunning. I love tomatoes and this is a perfect recipe – simple, comforting and delicious. Will this be good if partnered with chapati? wow, why havent i discovered you before! i love your authentic dishes. the curry looks gorgeous! 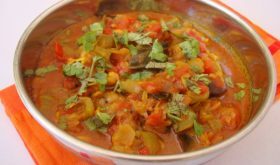 we launched http://www.veganchutney.com/ , a photo gallery for Indian Vegan food. Please do drop by to submit your indian and vegan recipes like this kura. It is difficult to find recipes on a special diet, so i am hoping this gallery will help a few. Thanks!. I prepared beerakaya tomato curry yesterday and it tasted so delicious. Thanks for the recipe. Good healthy dish. In the end, when the curry thickens, add a quarter glass of whole milk to even out the extra spiciness and impart a rich creamy flavor. Also you can add finely sliced potatoes along with the ridge gourd. The ridge gourd alone kind of shrinks during the entire cooking process. I’ve been making this curry regularly for at least a year, since I first found it. I absolutely love the flavor of the aniseed with the vegetables as well as the spiciness! My husband is also a big fan of this dish. We love to eat it with rice and yogurt. And it’s so easy for me to make, too. Thanks for sharing such a great recipe!